I like to mix and match various colours of textured card paper. I will of course put up some more examples for you to see shortly. 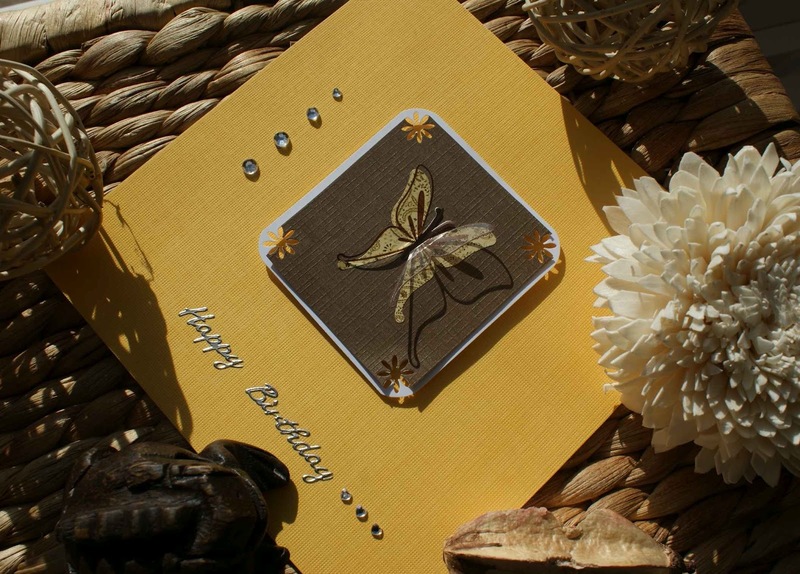 My favourite card papers are Papermania Solid Cardstock Assorted Colours (6” x 6”) and Matchmakers Textured Cardstock with white core that comes in sizes 6” x 6” and 3.875” x 3.875” in Neutrals or Brights. Take white card 15cm x 30cm and fold it in half. 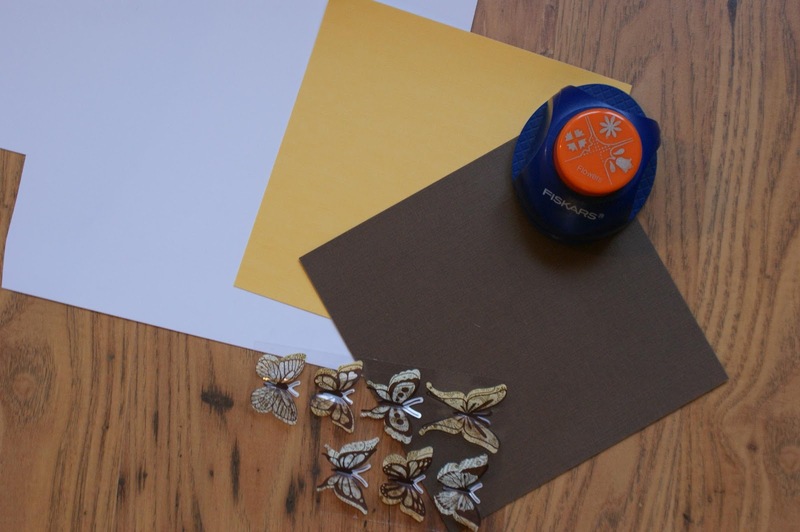 Take a yellow card paper (size 15cm x 15cm) and using double sided tape attach it to the white card. 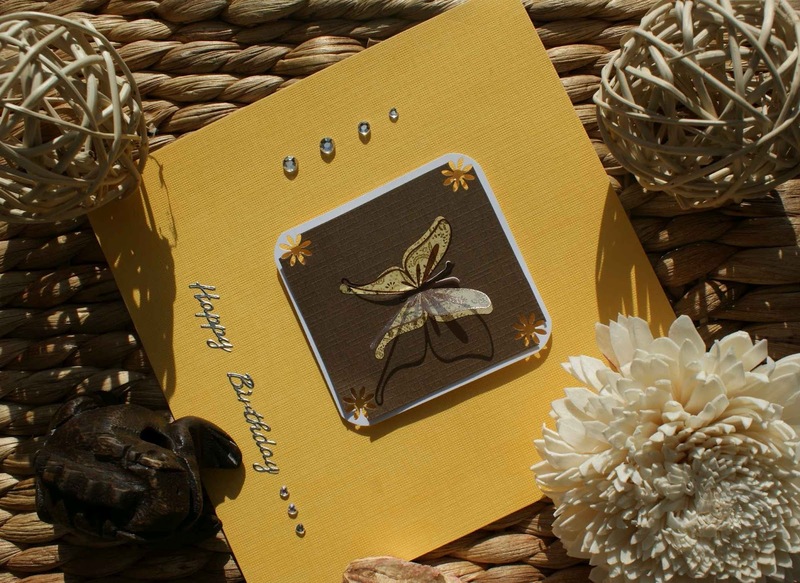 Attach brown card (6cm x 6.5cm) to a piece of a white card (6.5cm x 7cm) so that the white card is framing the brown card and then attach the butterfly to the top. 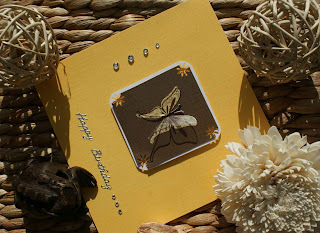 Cut out a daisy shape into the corners using the puncher. Attach the butterfly topper to the yellow card. Add “Happy Birthday” sticker to the card followed by 3 heart shaped gems. Attach remaining gems to the left of the butterfly topper. I wonder if you have any thoughts on this card or this design? Drop us a line, leave us a comment. I really look ofrward to hearing from you. Hot damn, you are starting to take decent pictures now Cheska! !